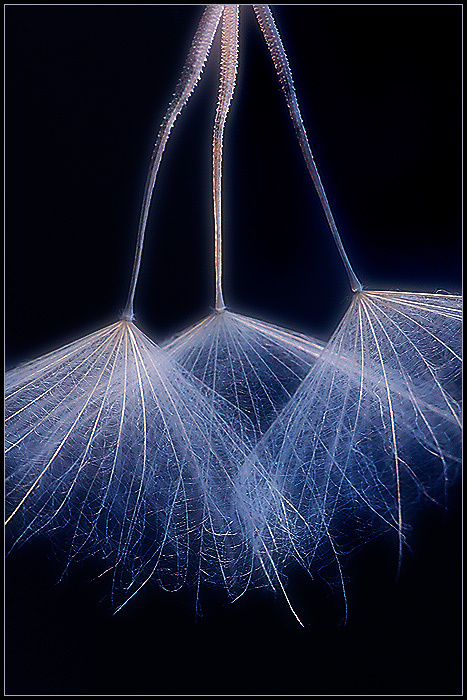 I've been out shooting false salsify seeds lately, and so this is one of my many, many shots of this subject. PP: I added contrast via autocolor, then added blue. I duplicated the layer and blurred the new layer, then set the layer option to "screen". I set the opacity of the layer to 60%. I then merged the layers and sharpened. I did some last minute fiddling with levels and cloned out a couple of twigs at upper left. Then I resized the image for web and resharped slightly. I added the border last. Proudly hosted by Sargasso Networks. Current Server Time: 04/26/2019 09:40:51 AM EDT.